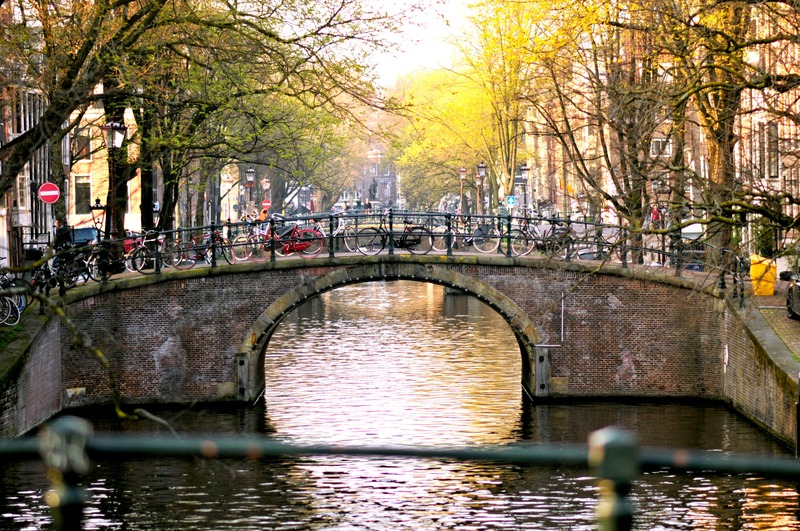 I am back in Amsterdam and Spring has finally arrived! What better way to ring in the new season by updating our wardrobes. After being bundled up, wearing thick and heavy Winter wear, we all need the perfect go-to outfit when the weather gets more comfortable right? Yes, we are done with cold and so ready to dress a little bit barer. Finally! We gravitate to lighter colors and fabrics when the sun is out and comfort is key in my opinion. 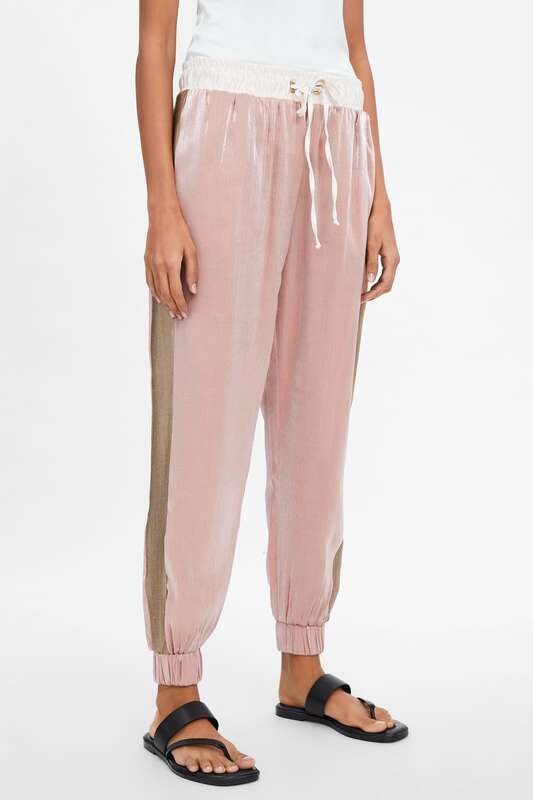 A pretty top, comfy joggers, finished with classic outerwear has been my day to day uniform lately. So let’s talk trends here. While roaming the big brand stores and keeping my eye on the latest catwalk trends, I’ve noticed the blazer trend is back this Spring. Of course, a classic blazer never went out of style, but now they are just everywhere. In all shapes, forms, and colors. A blazer is just so easy to throw on and looks great with just about anything you wear! Perfect for casual, fun and also more formal events. Sequins are also a fabulous new trend I am loving at the moment. If you think you can only wear them during the holiday season your wrong! The key is to mix sequins with neutral pieces like a classic trench coat or like I am wearing here paired with a linen blazer. The linen fabric will make the sparkles pop without the worry looking like a Christmas tree. If you really want to go for comfort and still look pulled together, you can wear this look with a fresh pair of sneakers or flat sandals. Lately, I’ve been loving a polished look without looking like I tried to hard. What I really like to do is mix multiple fabrics, As you can see, every piece I am wearing here is from a different fabric. Still, they manage to compliment each other. This also works really well while styling a monochrome look, meaning if you wear all your pieces in the same color. It makes an outfit that more interesting don’t you think? Have you noticed that the round straw bag will be huge again this Spring and Summer? 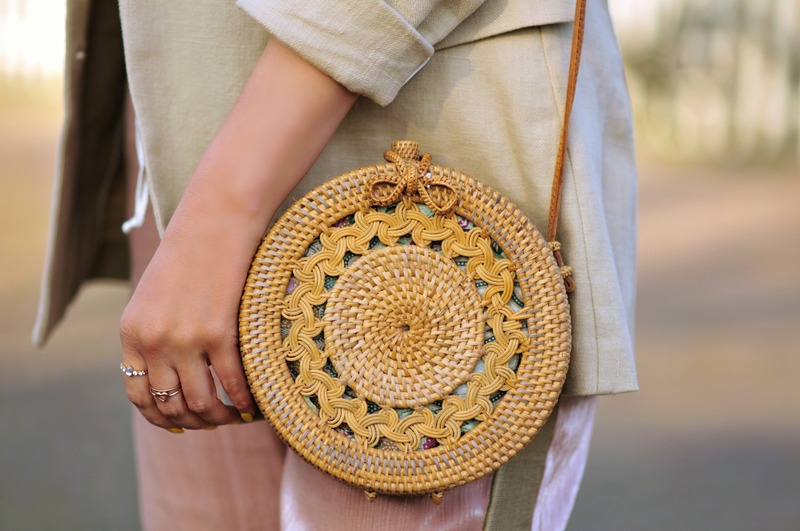 The trend has been going strong for a while now, and it started with the rattan round Bali bag craze a few Summers ago. It’s so fun to spot big brand stores like Zara, H&M, and Mango taking their own twist on the round straw bag and adding the trend to their Spring collections. The rattan Bali bag I am wearing will be added to my online store which you can shop here, so yay! Click on TC’s Boutique in the menu to find different styles and colors that will take your Spring outfit to the next level. What’s your favorite Spring look? Thanks for stopping by everyone! "40 Things I’ve Learned In My Fourties"